One of the signature features of Bhutan’s five year plans has been the reliance on grant or developmental aid from donor countries also called developmental partners. 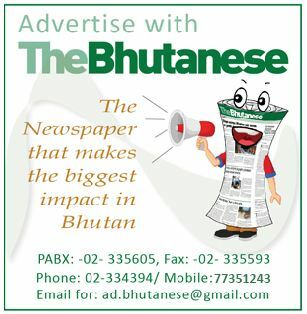 Bhutan’s initial five year plans and particularly the first four five year plans from 1961-1981 was overwhelmingly financed by donors with the biggest and most important being India. Bhutan, over the years, also had other important donors like Japan, EU countries, the Swiss and multilateral institutions like the United Nations, World Bank, Asian Development Bank etc. It was only from the 5th five year plans from 1981 onwards where Bhutan’s domestic revenue could start to pay for a majority of the plan expenditure with donor assistance averaging around more than 30 percent of the plans until the 11th plan. Aid from external donors was 32.21 percent or Nu 48 bn of the ambitious Nu 148 bn 10th plan. In the even more ambitious 11th plan of Nu 217 bn the grant component was 31.33 percent or Nu 68 bn. In the latest draft of a much bigger Nu 309 bn 12th plan the grant component is only Nu 61.65 bn. 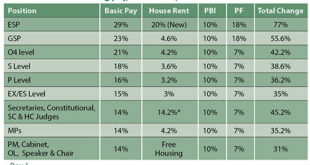 This is only 19.95 percent of the 12th plan and a drastic fall compared to all previous plan periods. The 12th plan figures are still at a draft stage and will undergo some changes with the new government, but it is expected to largely stick to the grant figures. Another feature in the grant component of the 12th plan is that grant will be a bit more diversified including getting funds from multilateral agencies or funds like, for example, on climate change. There are three main reasons for Bhutan’s fall in the grant share of the draft 12th plan. The primary reason is an increased domestic revenue expected in the 12th plan. The projection in the draft 12th plan is Nu 218 bn which is much more than the Nu 128 bn in the 11th plan. The second reason is that as Bhutan is set to graduate from its Least Developed Country (LDC) status to a middle income one by 2023 some donors have withdrawn or have started withdrawing. DANIDA and the Netherlands have left while the Swiss, Austria and World Food Program are phasing out too. The third reason is a conscious choice by Bhutan to not seek more grant assistance and also diversify its grants base in the 12th plan. The former PDP government took the first set in this regard when it capped grant at around Nu 60 bn in the draft 12th plan before it left office. The former government at the time also decided that as part of its larger policy of reducing grant dependency it would not seen an increase in the grant amount from India for the 12th plan. This meant that since Bhutan got Nu 45 bn in grant from India in the 11th plan it would seek the same amount in the 12th plan. This in turn would mean that from funding 23 percent (Nu 45 bn) of the 11th plan India would be funding 14.56 percent (Nu 45 bn) of the draft 12th plan. This is compared to a time when India funded 100 percent of the first two five year plans from 1961 to 71, 90 percent of the third five-year plan from 1971-76 and 77 percent of the fourth five-year plan from 1976 to 81. The reasoning for reducing Bhutan’s overall grant dependence during the final years of the former government’s tenure was to strengthen Bhutan’s stated and long term goal of self sufficiency and in doing so its sovereignty. The approach was to modify the Bhutan-India relationship from the traditional donor-recipient relationship to a modern one of investment and trading for mutual benefit. It was felt that this would not reduce India’s close friendship and importance to Bhutan given that India would still be Bhutan’s largest investor and trading partner through hydro projects, but it would give a relationship a more equal dimension and strengthen trust. It would also avoid any of the potential pitfalls and issues around grant funds from an international image issue to the general lack of flexibility in grant funding present anywhere in the world. The minister said that they would largely stick to the grant figures in the draft 12th plan though there would be some flexibility too, depending on the finalized plan. He acknowledged that the draft 12th plan that the new government had seen had shown Nu 45 bn in grant funding from India through he said that the plan is yet to be finalized and draft plan figures are tentative. The final figures would only be available once the plan is finalized. He said that Bhutan would require grants, especially till it graduates by 2023 from its LDC status. Lyonpo said that the focus of the government would be to enhance the domestic revenue to meet the funding requirements of the 12th plan. 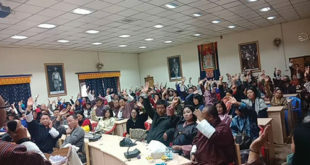 In response to a question Lyonpo (Dr) Tandin Dorji said that one such avenues to enhance revenue would be to get a good tariff rate for the upcoming 720 MW Mangdechu project. The DNT during its election campaign raised the Cross Border Trade in Electricity (CBTE) guidelines of India which negatively impacts hydropower development in Bhutan. It also wants to take up Sunkosh and Kuri Gongri reservoir projects. The new government on the one hand seems intent to not greatly increase the grant component of the draft 12th plan but on the other hand it will be under domestic political pressure to deliver its various pledges. The new government will have to walk a fine balance between the long term interests of Bhutan and also pressing short term political considerations. In a related matter the new Prime Minister Lyonchhen (Dr) Lotay Tshering told the visiting Indian Foreign Secretary Vijay Gokhale on 19 November that Bhutan’s foreign policy should not change every 5 years with a change of government. 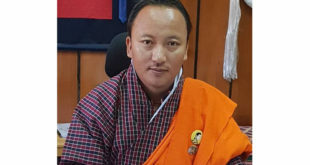 In earlier interviews to the media Lyonchhen conveyed that Bhutan would follow the long-term foreign policy laid down by His Majesty The King when it comes to India. The signal from the new government in Bhutan is clear that the relationship with India will continue to be a strong and positive one, but Bhutan will expect qualitative improvements in areas like fulfilling hydropower construction commitments, tariff negotiations, CBTE and other areas.